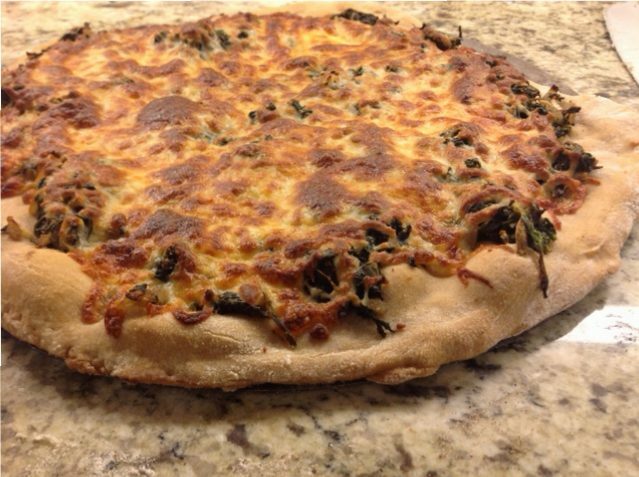 We’ve made some delicious Saag Paneer in the past few months, and we make a lot of pizza, so when TheKitchn, one of my favorite blogs, had a recipe for Saag Paneer Pizza, I knew we had to try it. 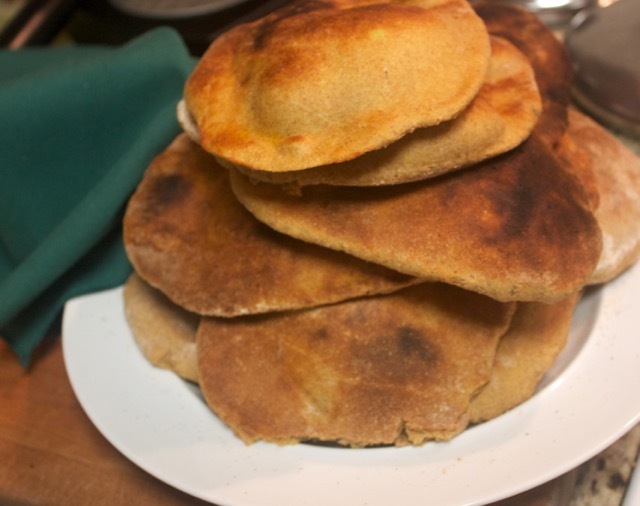 I am sure it would be great on Naan, but we just put it on our regular pizza dough and cooked it on the pizza stone. It was delicious! 2-4 cups shredded mozzarella cheese--we like it cheesy! Put pizza stone in the oven and preheat to 450. 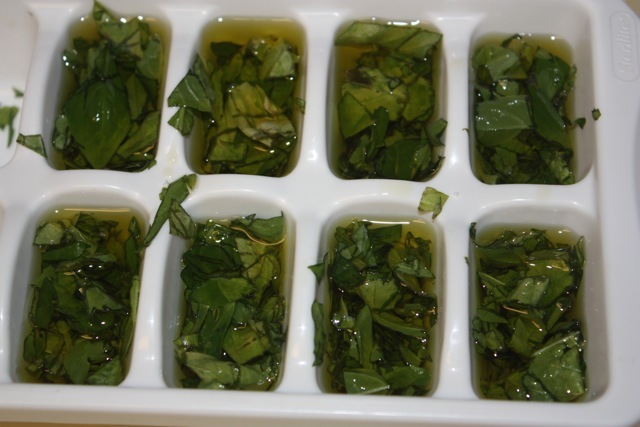 Thaw the spinach and squeeze out the excess water. Add the garlic and ginger and cook about 30 seconds. Add the garam masala and pepper and cook about 30 seconds. Remove from heat, add cream and lemon juice. Divide the pizza in two and roll out. Bake one at a time for about 10 minutes or until the cheese is melted and browned. Sounds like we should eat all the avocados we can between drought and Laurel Wilt, the industry has seen better days. I ran across this recipe on Vegan Richa trying to find something new to do with kale, and am very happy we tried it out. It wasn’t as complicated as it looks, but a good weekend recipe. While you could certainly leave out the sausage and keep things vegan, it was a nice addition. Mix the water, yeast and sugar in a bowl and let stand for 10 minutes or until frothy. Add all the dry ingredients and avocado and mix. Knead into a soft dough(3-4 minutes). Cover and let sit for 1.5 hours or until doubled. Knead for a minute to combine well adding flour if needed. Spritz with water and place the naan in the pan. Cover and let cook on medium high until it starts to puff. Heat a pan add some oil. But they were yummy and I made a couple of cups of brown rice early in the week and put it in the fridge and dinner was ready in no time! Worked out well. Also no cooking, which is always nice on a hot summer day. This one came from TheKitchn. We switched out the walnuts for sunflower seeds due to allergies and maybe simplified things a bit here and there. With rice in the fridge, this can be ready in about 10 minutes. It’s a very hearty salad that could be a main dish. Cook the rice and cool. I found it easiest to make up a batch of rice in the morning, put it in the fridge for the evening or a day or two later. 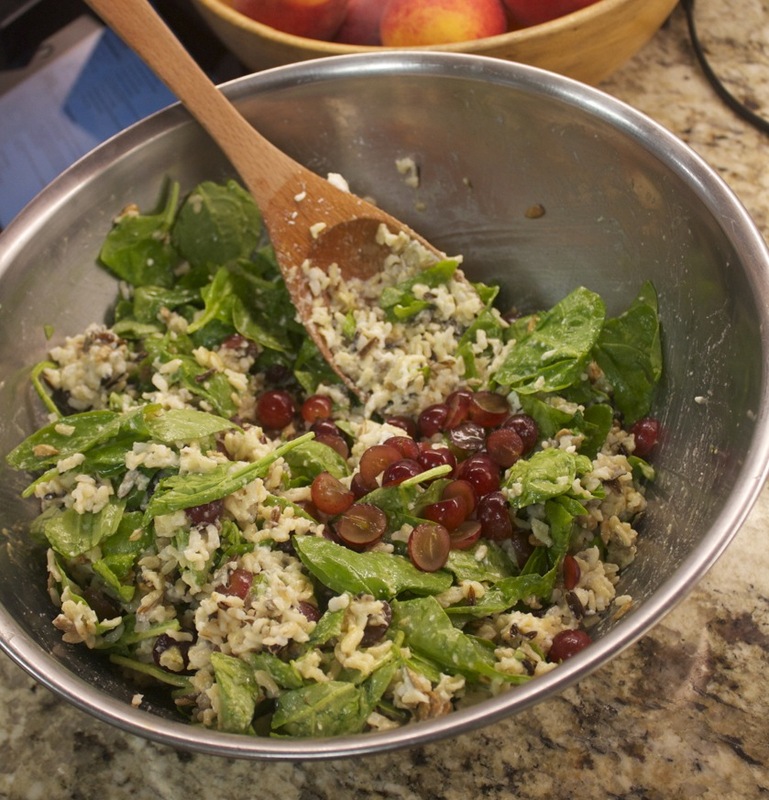 In a large bowl combine the cold rice, sunflower seeds, salad greens. Toss. In a small bowl mix the vinaigrette, whisking to mix. Pour vinaigrette over the salad and mix. Add the grapes and ricotta salata, toss a bit and serve cold. This Torta Española with Rainbow Chard recipe on theKitchn sounded really good, though we tend not to eat regular potatoes. 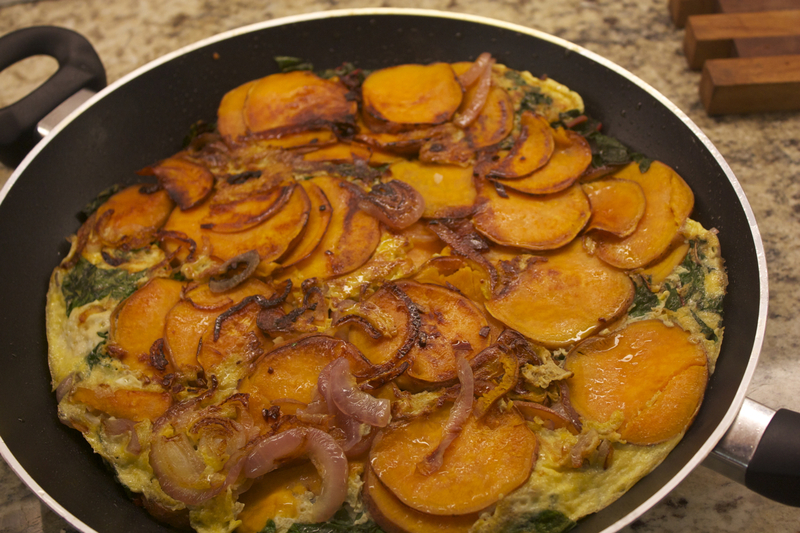 I wondered if it could be made with sweet potatoes and Googled around and ran into this recipe on Well Fed, Flat Broke. So, while I am sure Spaniards would complain that this has no resemblance to a true Torta Española, we mixed and matched between the recipes and came up with the delicious dinner. We increased the chard to 1/2 the bunch, and sautéed the rest with some garlic and served that on the side. Our only regret was that there were no leftovers! Heat the oil in a non-stick pan over medium-high heat. Add the potato and onion slices, stir to mix and coat with oil. Add the garlic and mix in. Cover and let cook until potatoes are soft, about 15 minutes, stirring occasionally. Put the sliced chard on top of the potatoes and cover. Cook another couple of minutes so the chard wilts. Pour the beaten eggs over the chard and cover, cooking another 5-8 minutes, or until the eggs are mostly set. Loosen the edges with a spatula and carefully slide the torta onto a plate. Put the pan on top of the plate and invert so that the torta is back in the pan upside-down. Cover and cook a few more minutes, until the eggs are cooked through. 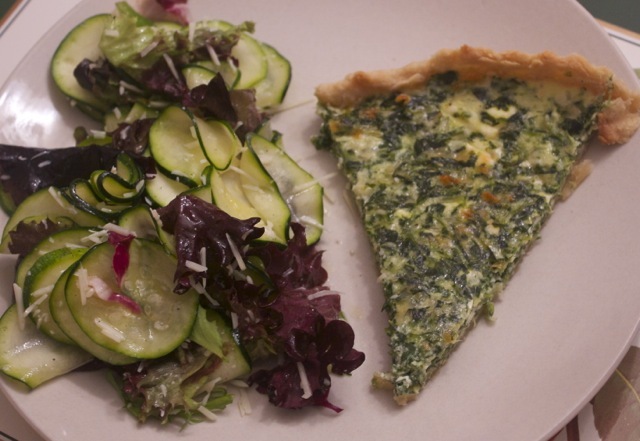 This Spinach Quiche recipe from SmittenKitchen was so good, we had it two weeks in a row! I just use my standard pie crust (1 c flour, 1/3 c butter, 6-8 Tbs water). 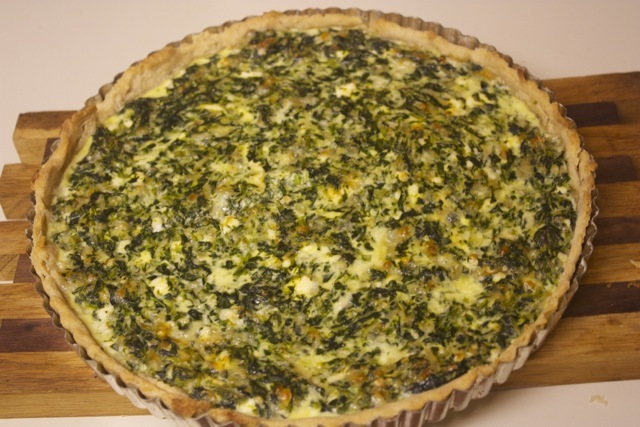 I think making this in a tart pan, rather than a pie plate keeps the quiche a bit shallower and that seems to make it extra yummy. We had gruyere cheese which was delicious, we never did try it with cheddar as the original called for–maybe next time 🙂 ! Everyone in the family was fighting for leftovers. The second time, we basically doubled the recipe to make sure everyone had a delicious lunch the following day. This goes really well with the Zucchini Carpaccio Salad, also from SmittenKitchen. With a fork, mash up the cream cheese in a medium bowl. Gradually add in the milk and eggs, mixing well. Pour mixture into uncooked crust. Bake until crust is brown and filling is set, about 25 minutes. Frozen ravioli makes a nice start to a fast dinner. We had gotten tired of ravioli a while back since all we did was add some spaghetti sauce. This recipe is a relatively fast and easy dish that adds flavor, veggies and something different to the routine. We used beef ravioli, though with cheese ravioli this could be a vegetarian dish. To make the cooking go a bit faster at meal time, you can dice the squash ahead of time and store in the fridge until your ready to go. Heat the olive oil in a large skillet and add the butternut squash. Cook covered, stirring occasionally, until the squash is soft and starting to brown (10-15 min). Meanwhile boil the water for the ravioli and prepare according to package directions. When the squash is ready, add the garlic and thyme and cook uncovered for a couple of minutes. 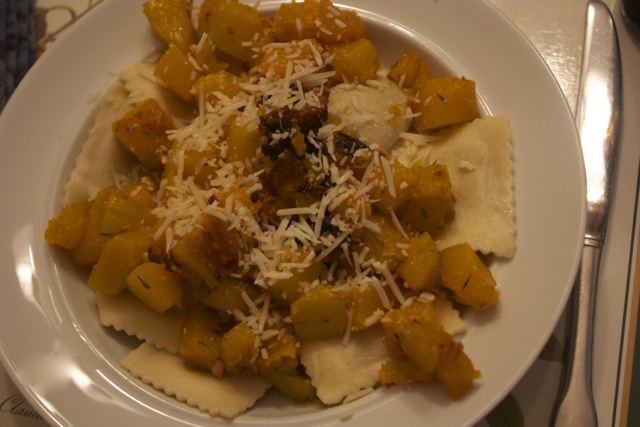 Serve the ravioli, topping with the squash and a sprinkle of Parmesan cheese. I’m always on the lookout for new sweet potato recipes. Besides being tasty and popular with the kids, they have a lot more going for them than regular potatoes (e.g. : this site). So when I ran across this recipe for Sweet Potato Samosas on Culinate.com, I decided to give it a try. I added some ground beef, though you can leave that out for a veggie option. I’ve also thought peas were a required part of samosas, so I added a can. These were quite good and made a lot. In fact, with the peas and beef, I think you would need 2 batches of the dough for all of the filling. We just served some filing on the side and for left-overs. The green sauce was especially good! Using the paddle attachment of a stand mixer, beat the cream cheese and butter together until smooth and creamy. Add in the flour half a cup at a time, mixing until it comes together in a ball. Microwave or bake the sweet potatoes until soft. Peal and mash the potatoes in a large bowl. Brown the ground-beef if using, or add some oil. Transfer the beef and onion mixture to the bowl with the sweet potatoes. Drain the peas and gently mix them into the mixture. Set aside to cool--the dough gets too soft if the filling is too hot. Using about a 3-inch round cookie cutter or biscuit cutter, cut circles in the dough--I used a big wide-mouth jar. Place spoonful of the sweet-potato filling in the center of a dough circle and fold in half, sealing the edges. Place on the parchment-lined baking sheet. Once the sheet is filled up, bake until the edges are lightly browned, about 20 minutes. While the samosas are cooking, combine the sauce ingredients in a food processor or blender and process until smooth. 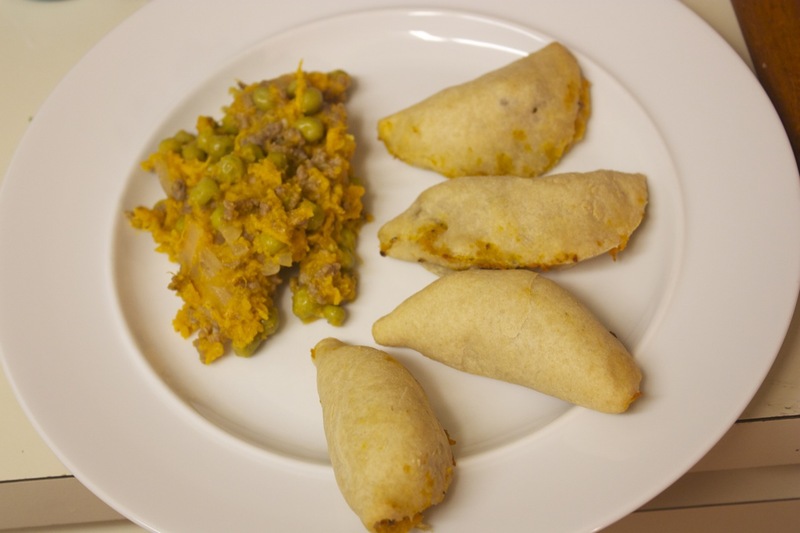 Serve the samosas warm or at room temperature. 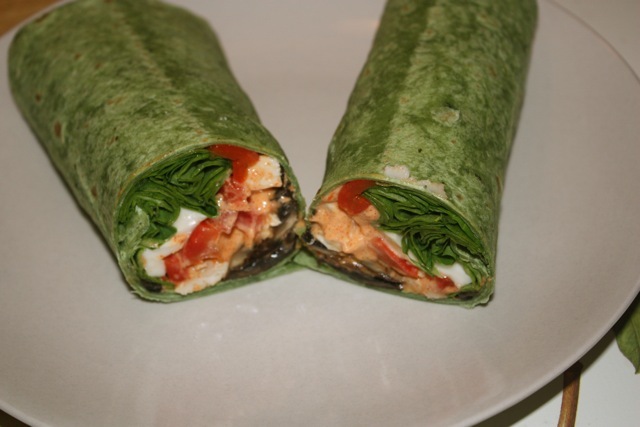 These wraps from FoodandStyle.com were easy to make and delicious. This is a great weeknight recipe as everything comes together quite quickly. We used spinach tortillas which, surprisingly enough, were a hit with the kids. Cut the mushrooms in ¼” slices. Lightly brush a rimmed baking sheet with olive oil. Spread the mushroom slices onto the sheet in a single layer. Brush with the rest of the olive oil and grind some pepper over them. Bake for 6 minutes. Turn the mushroom slices over and continue baking for another 6 to 8 minutes until the slices are golden-brown at the edges. While the mushrooms are cooking, mix the mayonnaise, lemon juice and paprika. Arrange the mushrooms in a row across the bottom third of the tortillas. Spread the mayonnaise on top of the mushrooms (about 2 tsp of mayonnaise for each tortilla). Top with the mozzarella slices and sprinkle pepper to taste. Top with peppers and the baby spinach leaves. Roll each tortilla, cut in half and serve. A few weeks ago we planted a pot herb garden. We actually have 5 pots, one with basil, one with mint, and 3 with cilantro that we started from seed–the only cilantro plants we could find in town looked really pathetic! The garden has been doing fairly well, though after the recent rains, I need to remember to go back to watering it almost every day now. The basil plant keeps getting taller and taller, so we decided to trim it back quite a bit to keep it from bolting too much. That lead to the “problem” of having too much fresh basil. of course I hadn’t thought far enough in advance to plan a meal needing pesto or using lots of basil, so we wanted to find a way to save it for later. 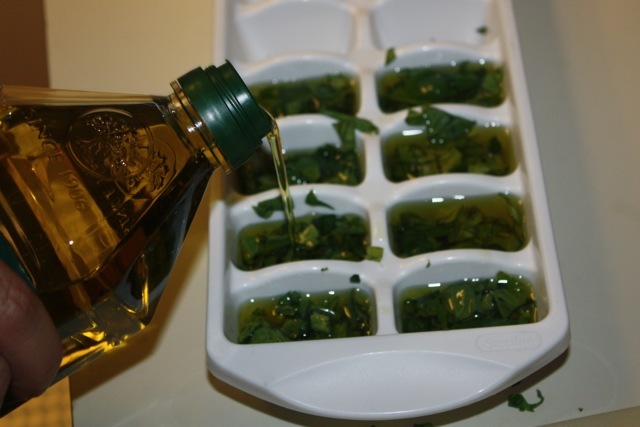 The best idea I found online was to chop it up, put it into an ice cube tray add some olive oil and freeze. Worked out really well. This morning I threw a cube into a skillet and scrambled up some eggs for breakfast–oil and seasoning all in one! 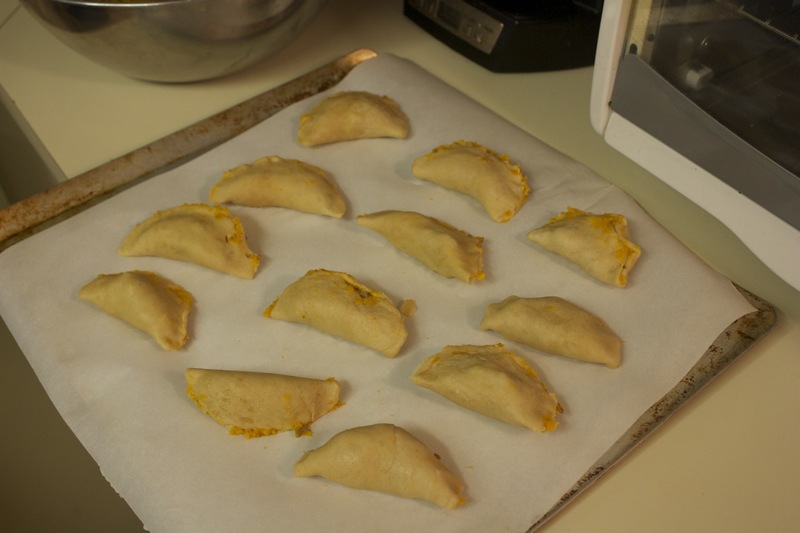 These yummy pasties were fairly easy to make. I made the chopped the squash and made the dough in the morning and left it in the fridge until about 30 minutes before we were ready to make the pasties. Throwing them together in the evening didn’t take very long and then you have 40 minutes to do other stuff before dinner. Cut the butter into the flour using a pastry blender or your hands. Start with about 5 Tbs of water and then add 1 Tbs at a time until all the flour comes together to form a nice ball. Refrigerate 30 min or longer (if you wait more than a couple of hours, let the dough warm up a bit so it can be rolled out. In a large bowl combine the filling ingredients. Divide dough into 4 pieces and roll out into circles. Spoon the mixture over half of the dough circles and fold over, crimping the edges shut. Transfer to backing sheet. Cut steam vents in the pasties, paint tops with beaten egg. Bake for 40 minutes at 375.